Paige and I were raised in Texas where grilling and BBQ is in most every back yard—bringing friends, family, and neighbors together at celebrations and weekends. We met in 1996 in Architecture School, married after graduation, and moved to Denver for a few years. Austin, Texas was the next place we called home where we bought a place and I started honing my grilling skills and techniques around the fire with other weekend grill masters. 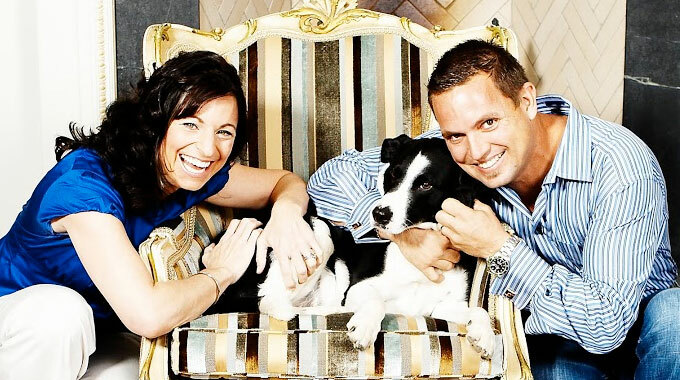 Ten years later we packed our bags and followed a dream to move to the Big Island of Hawaii. Our last summer in Texas my Mom gave me a gift of Smoked Salt. I fell in love with the rich aroma and taste. I soon ran out of smoked salt and looked all over the island and asked friends but no one had a clue what I was talking about. At some point I had a thought that I could make it myself. 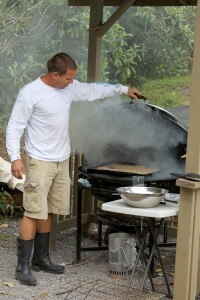 I found some awesome local salt from the Kona side and began my hundreds of hours perfecting my smoked salt with local woods. I made enough to have at home and to give out to friends and neighbors, excited to share my new creation. I was shocked at the positive feedback and encouragement that I received when giving it out. We then decided to have fun and take it to the public via Saturday’s Farmers’ Market in Waimea and the Homestead Farmers’ Market. Now, if you are reading this, you are at our next step of trying or sharing our beautiful smoked salts. Try it and enjoy it with your friends and family. Water from the Pacific Ocean is brought up from 2,200 feet deep on the Kona coastline of the Big Island of Hawaii, also known as the Volcano Island. The water is desalinated—the result is a white flaky deep sea salt. We take the salt a step further and cold smoke it for hours to infuse the crystals with a unique flavor, aroma and color. 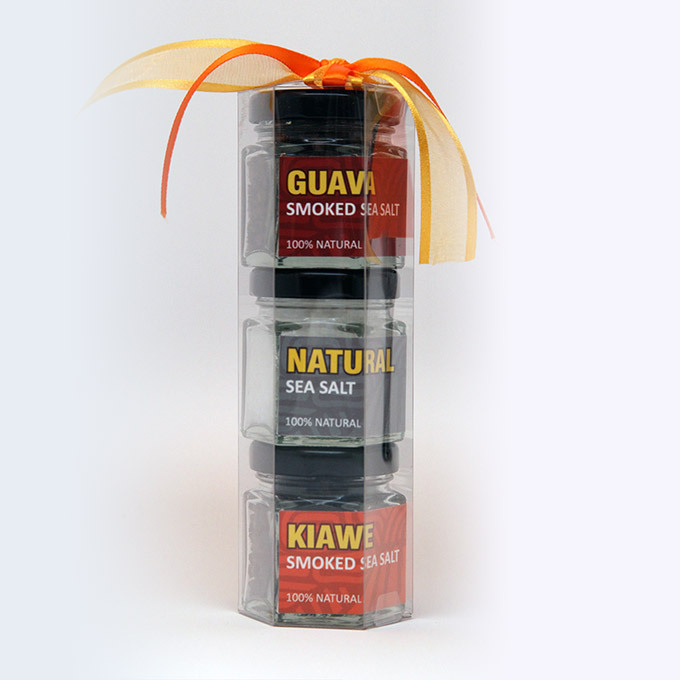 With great care and constant attention, two unique gourmet salts embody the characteristics of the selected Hawaiian woods; Guava and Kiawe. 100% natural way to add a roasted or grilled flavor to foods that have been prepared on the stove top, grill or in the oven. Guava Smoked Sea Salt: A fruiting tree, the guava wood characteristics are revealed as a light earthy sweetness in its aroma and flavor. The slow smoke process changes the white flaky crystals to a beautiful toasty caramel brown color. Try with seafood, poultry, steamed vegetables, as a rub and a smoky brine. Kiawe Smoked Sea Salt: Kiawe (pronounced [Kee-ah-vey]) is a thorny, brushy tree similar to a Texas mesquite, native to South America and widely naturalized in Hawaii. This dense wood gives the salt a bold and rich smoky flavor. The salt is transformed into a very dark iridescent ebony color. Goes great on red meat, pork chops, hearty vegetables, and creamy pastas. Well below the turbulent ebbs and flows of the ocean, sunlight, and warm waters there is a purer uncorrupted layer of water that we have tapped into. The deep layer of water is from a melted polar ice cap which migrates through the Pacific Basin to Hawaii’s shores. The sea salt has been tested and boasts 48% less sodium than table salt and more trace minerals. We get the salt from a company on the island who is air, sun and solar evaporating the salt water on screens in greenhouses in the Kailua-Kona sunshine. A flaky soft salt remains. The woods we use for smoking are gathered from trees cut for prescribed firebrakes or naturally fallen trees in neighborhoods and State land on the island. The smoke gives the salt a luxurious dark honey or black iridescent color. The smoke infuses the crystals with a roasted complex smoky caramelized flavor. The smoke permeates the salt with a sophisticated bouquet. We don’t add seasoning for flavor nor roll the salt in activated-charcoal for color.